Is #avadoesitagain a thing? Because if it’s not, it definitely needs to be. If you’ve been following me on Instagram, then you probably know that I’m a huge fan of Earthwise Beauty. Ava Zhan, the owner / founder / formulator behind Earthwise Beauty, creates the most one-of-a-kind skincare products, each uniquely special in their own right. Ava’s newest creation, Sungod, is no exception. This triple-milled, fine powder face mask is the second dry / powder face mask in Earthwise Beauty’s collection, behind Catharsis. 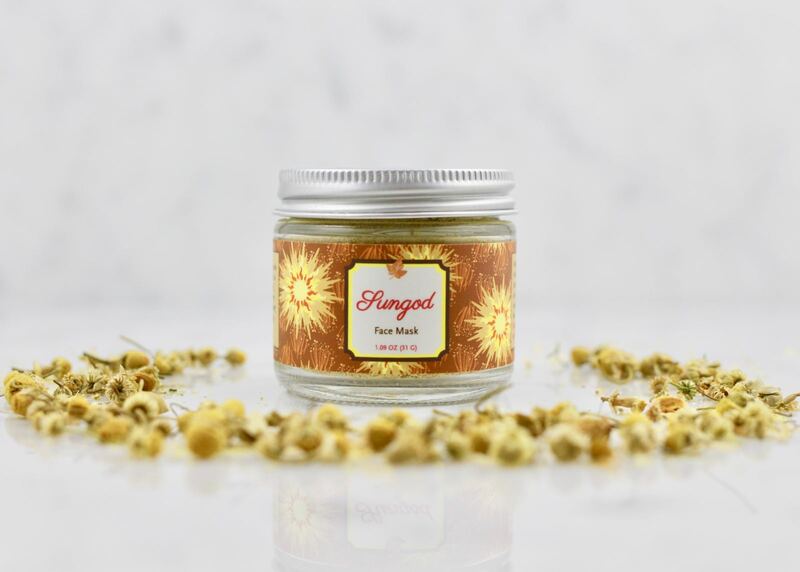 This nurturing face mask, which I have dubbed a “pot of gold” (because of it’s yellow hue and because of the fine botanicals in it), is a godsend (pun intended!) for sun damaged skin or skin that’s been compromised or damaged by external environmental factors. 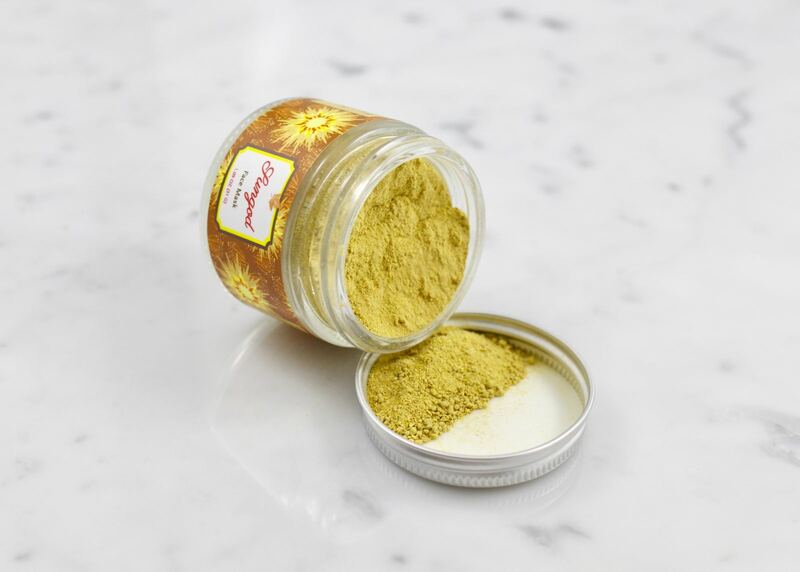 Sungod is different from Earthwise Beauty’s other masks in that it does not offer immediate results; it will take frequent applications over a course of a few weeks for the ingredients to truly work their magic. (Cell regeneration normally occurs after 28 days.) After a few weeks, chronic skin conditions like acne, psoriasis, and eczema should improve dramatically and heal faster. Improved elasticity, skin tone, brightness and firmness can be expected as well. This beautiful, potent mask boasts an impressive list of nutrient-rich ingredients ranging from adaptogenic herbs, roots, mushrooms, leaves, seeds, flowers, to Celtic sea salt. The key ingredients being wildflower pollen, calendula (Ava’s favorite), comfrey, goldenseal rhizome, and pomegranate. So far I’ve used the mask 2-3 times a week for the past couple of weeks using a variety of “binding” agents such as water, hydrosol, raw honey, and face oil. The face mask is a beautiful golden hue when dry and turns into a yellow-mustard / split pea soup color when wet. It is suggested that you use 1/4 to 1/2 a teaspoon of the dry powder per application but I found that I liked using a full teaspoon to create a thicker mask. I use equal parts (give or take) of water, hydrosol, or raw honey and the powder turns into a slightly grainy, creamy paste. It’s important to get the ratio right otherwise the mask is a bit hard to apply. The scent is like a mixture of calendula, grass, with a hint of mushroom. I know it doesn’t sound appealing, but I promise you it smells better than it sounds. The mask is very cooling upon application, but it dries fairly quickly, so misting is necessary if you prefer a wetter mask (like me). I initially left the mask on for 30 minutes or so, but left it on longer for the last few masks. The mask includes turmeric, and my skin only tolerates small concentrations of it. The last time I used the mask, I left it on for well over an hour, but that wasn’t the best idea; my skin had a bit of a reaction to the turmeric being on my face for so long. My skin was extremely red and splotchy after I washed the mask off, but after using a very gentle, simple routine that night, my face was as good as new the next day. Lesson learned: I won’t be leaving the mask for that long ever again. After experimenting a bit with the different “binders,” I’ve been really enjoying the mask with the raw honey or with a hydrosol with a few drops of the Ruby Facial Oil for some extra oomph. In both cases my skin felt incredibly soft, smooth, and nurtured after use. Since I’ve only used the mask for a couple of weeks, I will update this post after I’ve used it for another few weeks. But so far I’m really loving the mask and the long-term results look very promising. I will keep you all posted! The Sungod Face Mask (1.09 oz) retails for $50.00 USD and can be purchased directly from Earthwise Beauty. The Earthwise Beauty Face Mask was kindly provided for consideration, however all opinions expressed are my own. This post contains no affiliate links.